Sardina del Norte is dived in the summer months because then it is the place where Mobulus Rays come to shore to feed. The dive sites around Sardina del Norte and Puerto de la Nieves are on the opposite corner of the island to the popular tourist resorts of the south and west, making it a drive of almost 100km to get here. Few tourists therefore visit this area, where there are several shore dives down to aproximately 25m. The rocky shore has many sea urchins and the typical harbour species of wrasse, damselfish, mullet, octopus and cuttlefish can all be found here. This can also be a good place to find Angelsharks and small rays. 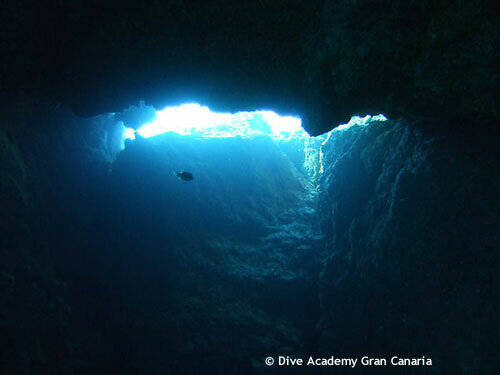 The dive at Caleta Bajo has numerous small caves and overhangs, but in autumn it becomes a very popular dive as Mobulus Rays, a small manta ray, feed in this area and are frequently seen by divers. Entering this dive site is tricky but once you are in the water everything is easy. Stay still and mantas tend to come very close. Puerto de la Nieves (Agaete) is the terminus of the ferry to Tenerife, and from the beach it is possible to snorkel a long way out without dropping into deep water. Parking near the beach is very limited, and there are no dive schools in this area, making it once again a very long drive from the resorts of the South.